We calve twice a year. In the spring and in the fall. It allows us run our bulls from Memorial Day to Labor day during the summer giving us spring calves and from Thanksgiving to Valentine's Day giving us fall calves. This allows us to run bulls for three months, then rest them for three months. It also allows us to have a smoother operation as far as weaning, branding, feeding, and raising. 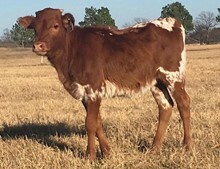 It also keeps any calves from coming during the heat of the summer where flies and weather can be less than favorable or from the cold and misery of winter. This fall we have an exciting bunch of calves coming. RM His Royal Highness calves are coming out of our mature cows. He's a huge bull body wise that's also closing in 90"ttt. Royal Ranger calves will be hitting the ground on our CherryHill herd. He's the grandson of Jamakizms' Alphie on the top side and Drag Iron x Royal Reputation on the bottom side. This should be a fun calf crop to watch. Exciting group coming in the spring 2019 at G&G Longhorns. We have a mixture of our second calf crop of Sniper calves as well as a nice calf crop from Royal Ranger. This should be a wonderful time.